Thelma Gladys (Brownrigg) Flewelling of St. Stephen passed away peacefully at her residence on Friday, April 6, 2018. 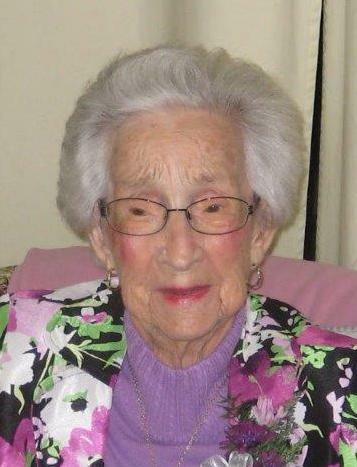 Born in Bocabec, NB on September 18, 1917, she was the daughter of the late John and Susan (Young) Brownrigg. She was the last surviving member of her immediate family. Survived by her three daughters: Jane Wood (David) of Amherst, NS; Ann Flewelling of Fredericton, NB; and Joan Flewelling of St. Stephen, NB; two grandsons, Dr. Jeffrey Wood of Columbia, Missouri and Andrew Wood (Kristy DeDuck) of Montreal, Quebec as well as several nieces and nephews. Thelma was predeceased by her husband, Joseph MacVay Flewelling, and six brothers and sisters. The S. O. Mehan & Son Funeral Home Ltd., 23 Main Street, St. Stephen, NB, on Wednesday, April 11, 2018 between 2:00 and 4:00 pm.